Recognize and honor the importance of our Society in preserving our past for the future. Our properties include the Dekker-Huis / Zeeland Historical Museum, dating back to 1876, and the New Groningen Schoolhouse, which dates back to 1881. Create a legacy gift to the Zeeland Historical Society by naming the Society in your will or as a beneficiary of a life insurance policy, IRA, trust, or brokerage account. You can also create a long-term gift to the Society while receiving income for life through a charitable gift annuity. You can begin by talking with an attorney, an accountant or other financial advisor. 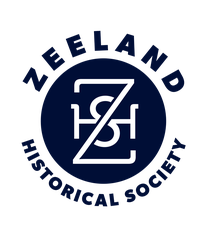 The Zeeland Historical Society is a 501(c)3 organization and your gift may be tax deductible.